Henry Cook hails from a family whose roots are firmly planted in the Binghamton area. You may have heard of his great-grandfather who started Cook Brothers Truck Parts 100 years ago. Henry works with his father and his two business partners making him the 4th generation of Cook to be in that business, but he also decided to put his nearly 20 years of experience in the promotional products market to good use when in 2016 he started Heavy Duty Promos – a company that offers the very best promotional product solutions to help their clients strengthen the emotional connection between their brand and their target audience. Henry says he feels rewarded knowing that the company’s success is 100% tied to the success of his customers – that’s a powerful motivating factor! When Henry is not at work he loves to spend time with his two sons, especially watching them play sports. 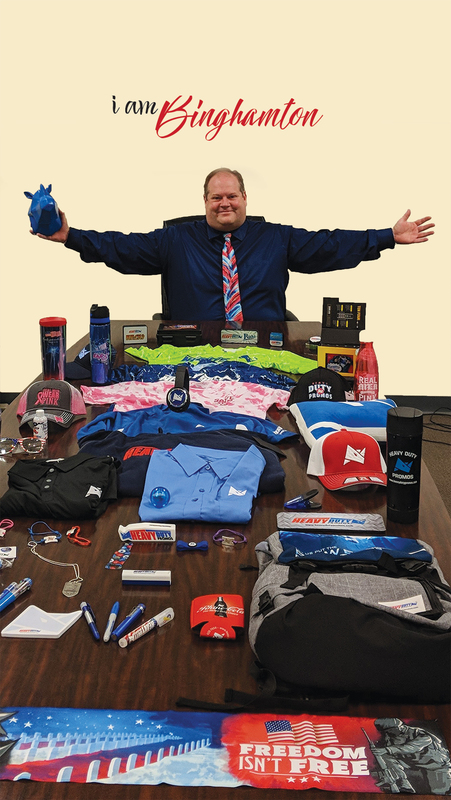 He also is a big fan of giving back and has done much for this area including participating in the Real Men Wear Pink Campaign through the American Cancer Society, supporting athletic teams his sons are on either with assistant coaching or helping with fanwear, and offering special pricing programs for non-profits looking for promotional items. His life motto is to always try to be the very best version of you that you can be. And Henry says in whatever you do personally or professionally, if you make helping others a priority, you will become their priority. Thank you Henry for making this a great place to live.